Triathlon through the middle of a million strong metropolis - that's something you will only find in Hamburg. Each year the ITU World Triathlon Series is staged in front of a record breaking backdrop. Nowhere else are the athletes cheered on so frenetically by such a mass of enthusiastic spectators. Nowhere else do the athletes have such impressive scenery. 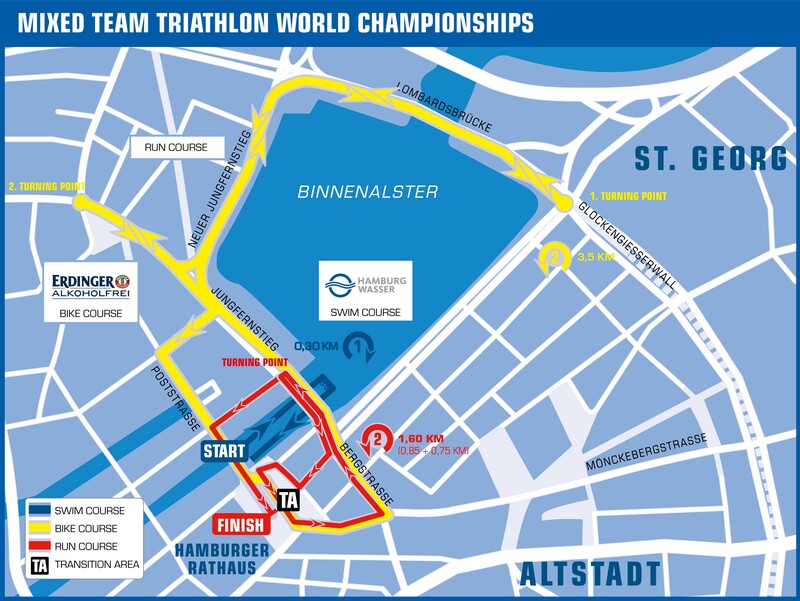 Swimming in the Alster, cycling on the main shopping streets of the old trading city, running around the Binnenalster and the finish in the Triathlon stadium in front of the historic setting of the Hamburg City Hall - this is all part of the ITU World Triathlon Hamburg. The start area is at "Jungfernstieg". Athletes will start from the quay along Jungfernstieg and stand in a staring position approximately 75cm wide. There is just one lap to swim. There is a rather dark tunnel about 40m long, which has to be swum throug. Please notice: Due to shorter swim distance there will be no short landing on a pontoon this year. Generally flat profile with no noteworthy climbs. There are six circuits of 3.5 km to ride. The route is technically demanding, due to the many changes of direction and tight turns. Very good tarmac surface. Generally flat course. There are two laps of 2.5km to run. Two 180° turns per lap. Very good tarmac surface. The swim start is at “Kleine Alster". There is one lap to swim. The turning point is directly behind the bridge Reesendammbrücke. Therefore athletes have to swum though the tunnel twice. Swim exit is at "Kleine Alster" too. Generally flat profile with no noteworthy climbs. There are two laps of 3.5km to ride; in total 7000m. The route is technically demanding, due to many changes of direction and tight turns. Very good tarmac surface. Generally flat course. There are two laps to run; 1st lap 950m & 2nd lap 750m. One 180° turn. Very good tarmac surface. 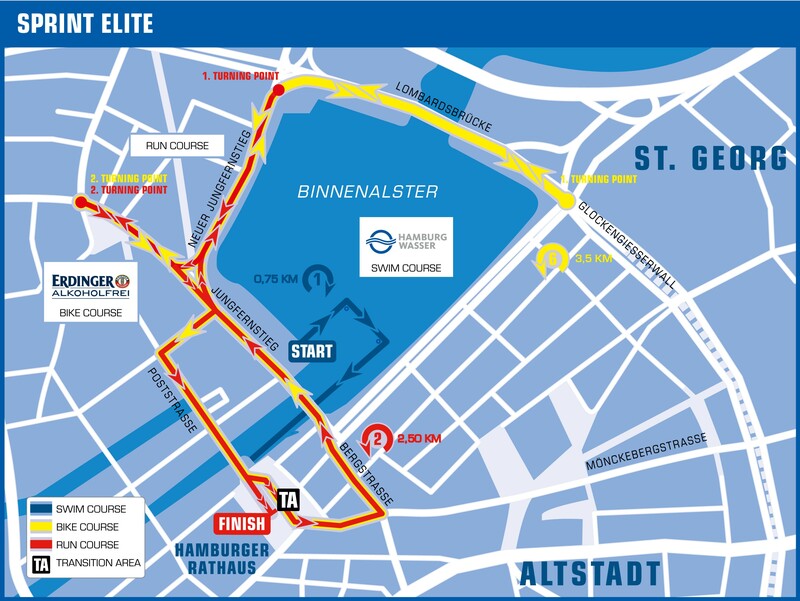 Relay Zone: Is directly located at swim start and swim exit at "Kleine Alster".